Uetliberg, “Zurich’s local mountain”, rises to 869 m (2,851 ft) above sea level, offering breathtaking views over the city, Lake Zurich and the Limmat Valley, and a panorama of the Alps. You can take S10 train line (almost) to the top (nobody is stopping you if you want to run all the way up to the hill, though). 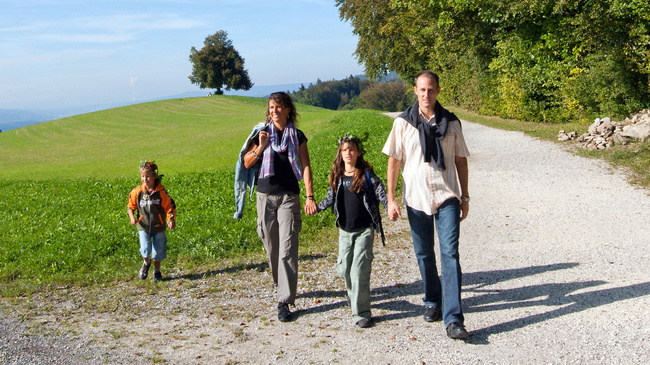 From the Uetilberg train station, run, walk, or climb the remaining 300 ft to reach the top of Uetliberg for access to a breadth of hiking, running and biking trails. Follow the paths that are named Gratweg, Planetenweg, or Wanderweg along the ridge. A combination of meadows and woods. The trails go along the Albis hill chain, so there are not really loop options available. A great run is along the ridge to Felsenegg (7.9 miles out and back), which features great views. Both Uetliberg and Felsenegg (804 metres / 2,638 ft) peaks feature lookouts with great panoramic views. If you want to re-fuel, bring some cash / credit card as there are several restaurants in both Uetliberg and Felsenegg. Once in Felsenegg, it is possible to take a the gondola lift down to Adliswil, and the S-Bahn (train) back towards Zurich. Note: this is a hilly, challenging run — 1,180 foot elevation gain — but most of that is the first 300 feet from the station. You can walk/hike the initial segment, then it is flatter along the ridge. The S10 train runs frequently from Zurich, and takes only about 15-20 minutes.